Digital Marketing - SEO, SMO, PPC, Graphics Designing: Key to Making Your Social Media Content Engaging! 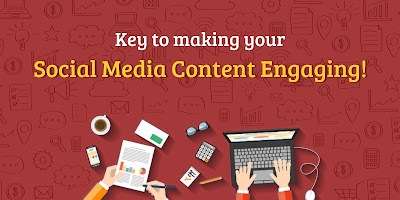 Key to Making Your Social Media Content Engaging! No doubt, social media has become an ideal platform for marketing, with brands restoring to various campaigns and initiates to connect with their audiences. It is a medium through which many brands are expressing their personality, creating awareness and are enjoying a great level of brand loyalty. But the trick here is doing it right. The post in the form of blog, image, video etc. provides a possibility for people to react and engage with the brand which later results in conversions and brand experience. All this happens when the content is witty, consistent and well-thought of, so that it drives the audience to be hooked to your brand page for more. Following are the tactics to create interesting social media post! Execution is just confusion without a plan! For an effective social media presence first step is to have a strategy which will act as your checklist to accomplish social media operations. Step into your customer’s world! Define your objective: Brand awareness or Brand loyalty, what’s your goal? Define Target Audience: Based on demographic and psycho-graphic research. Zero-down the Social Media platforms: Which platform is appropriate for your audience and brand? Create a Social network strategy: Based on a research on what your target audience like consuming and what more can you offer via your content. A theme is an abstract statement that enables your audience to understand the deeper meaning and the intention behind putting the content out for them. The crux here is to identify the purpose behind creating the content which will help you shape it. You have to use your theme to beam your idea into the mind of your audiences by understanding what will strike cord with them. Define a central theme for your brand strategy and revolve your content around this theme. Moreover, time and again you can create sub-themes to make your content more interesting. We live in an age where attention span is very low. A crisp and clear content, which is a well-structured, plays a vital role in providing a good user experience to the audience. A concisely written piece grabs reader’s attention and arouses their curiosity to know more. It doesn’t just pass the required information but is fairly understandable to the readers and is quick to consume. Gone are the days of “titles invite readers”. Now a day’s graphic designing makes a bigger difference in an over-crowded social media feed. Out of the box graphics is a quick way to express the message, convey emotion, showcase product and offers. Keep them creative, informative yet simple. Being proactive in nature will keep you updated, informed and ready to create engaging content. Be it any headlines or an article online, you should be in the research mode. Enthusiastic content creators are always scouring for a universe of information for premium content. You can use the information as an inspiration for your content further; it also plays an impactful role in keeping the content innovative.